The professional videos created this school year have had amazing reach, and we're ready to take that one step further! Beginning April 26, and continuing for 12 weeks, a 30-second promotional video for Academy of the Sacred Heart will be shown before every movie screening in the Emagine Palladium, Emagine Royal Oak and Uptown Birmingham 8 theaters. Come early (15-20 minutes before showtime) and see Sacred Heart on the big screen! We're Predicting a Home Run! On May 13, the Detroit Tigers have invited schools in the Archdiocese to Comerica Park. This year, our Upper School and Middle School for Girls choirs will sing the National Anthem! Tickets to the 7:10 p.m. game vs. the Astros are $30 ea. and include an exclusive, newly-designed Tigers/CHSL/ASH ball cap AND a Sacred Heart tee. Purchase your tickets here. All orders must be received by Friday, May 3! Project Term 2019 is officially in the books; stay tuned for a complete wrap-up. Until then, you can learn more about this unique program and look back at this year's educational journeys at ashmi.org/pt. Summer at Sacred Heart Now Enrolling! 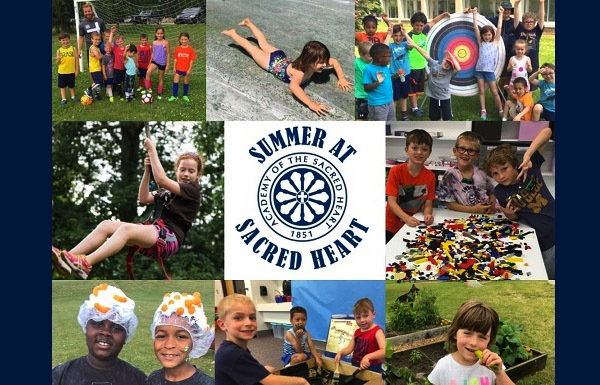 Summer at Sacred Heart 2019 offers 10 weeks of summer fun for children, age 4 - Grade 6! In addition to themed day camps, you can choose from tutoring, music instruction, overnights, sports camps and extended care. New for 2019 - lunch is provided! Learn more and register! "I love that all the staff bring a lot of positivity to the kids and guests here at school; the students are always super nice to each other." "The Academy of the Sacred Heart is a great learning experience. It helps you become the best you can be." "I would describe Sacred Heart as a sanctuary, a place where you can create tight bonds with the people around you. It has helped me strengthen my connection with God." "The teachers are really nice. They know how each student learns best and show us strategies to use ... I like brainstorming writing ideas with Mrs. McCaffrey." "ASH is a tightly-knit community where all are welcome. I really like the small class sizes because I am more confident - I get to grow more as a person and a student. " "This school is fun-loving and also creative. Goal 4, be a friend to all, is most meaningful to me because I do not want anybody to be bullied and I want to have lots of friends."